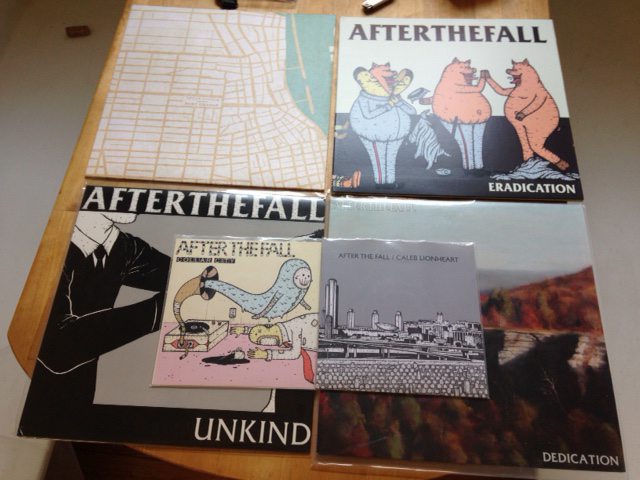 After the Fall has been banging out records up in Albany since 2006. These guys are influenced by the bands that I grew up listening to. They sound like they came straight off Punk-O-Rama 4 or a Fat Wreck comp. I always have wondered if they got their band name from that 98 Mute record from a while back. Maybe I will ask them that if they come out to Los Angeles. I really would like to see them live. I have never seen em. I think they are playing Fest so if you are headed to that I wouldn’t miss them. They should do a west coast tour with Heartsounds. Just saying. I got turned on to After The Fall when I stumbled across their “Fort Orange” Record and I have been on board since. After The Fall have floated from label to label with no real home. I say that only because I think they could just blow up on a label like Fat or Epitaph, but that is just me. “Dedication” finds its home on Bridge 9. The songs compliment the album title really well. Most of the songs if not all are about people that they know who have passed away. While a lot of songs from previous records have dealt with death, this record seems to be entirely devoted to it. If the record was longer than it was, I think it would be just too much death for me, but this quick fast paced punk record whips through 10 songs in under 20 minutes. That is my kind of record. They had some guests play on this record from legendary bands Decendents/ALL. Here are some songs that stood out to me. Reflection – Is a great opener to what the record will be. It is a sad record but with a lot energy and a ton of technical musicianship. That is one of the things I like about After the Fall. They have the chops. Dedication – This song has Karl Alvarez on bass and Chad Price doing some vocals. Elisa – Wow this is a sad song. Has some great energy though. I really enjoy the seamless transition into Condolences. Lived Fast – I like the stylized intro that fades into being full. The person they are writing to is the reason they started the band. Indian Ladder – Karl Alvarez also plays on this. This has some real nice technical parts at the 1:30 min mark. If this record was not about death, I would say that this record is fun. Go buy all their records. They are really great. I wish more people were on board with them. Listen to this record and all their other records here.